Pikeville Medical Center (PMC) is the only hospital in eastern Ky. to acquire the latest system available in stereotactic surgical techniques. The ATEC Stereotactic Biopsy from Hologic incorporates imaging, local anesthesia and tissue extraction, all in one system. Stereotactic breast biopsy is a non-surgical method of extracting a test-sample of a breast abnormality and is performed by specially trained technicians on an outpatient basis. A stereotactic breast biopsy is an option when a mammogram shows breast abnormalities, no matter how small. “PMC still performs traditional needle biopsies when needed, but there are advantages for the patient in getting a stereotactic biopsy instead,” said Assistant Vice President of Surgical Services Andrea Akers. With a needle biopsy, the patient must be put to sleep for the procedure. Only a local anesthetic is administered to perform the stereotactic breast biopsy. It is also much quicker and less invasive. The whole process takes less than one hour. A patient is scheduled for a stereotactic breast biopsy after a mammogram has revealed a suspicious area that needs to be investigated. A surgeon then makes the referral for this outpatient procedure. This system is so advanced it can biopsy two different areas in one visit. The samples are sent to the Pathology Department of the newly expanded PMC Lab to be processed in-house. 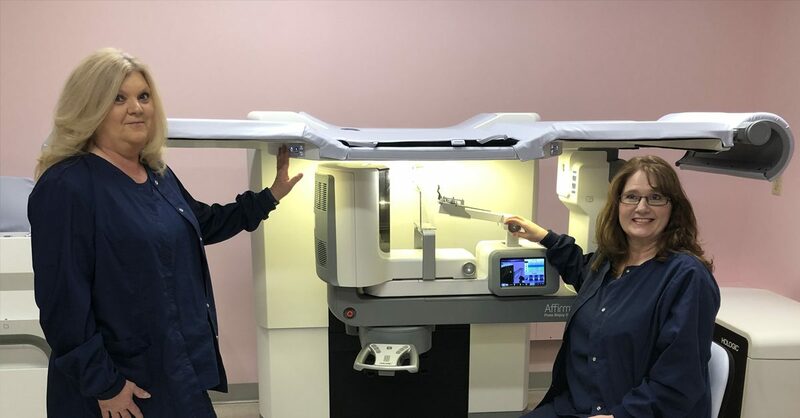 Akers says she hopes the service is widely utilized, because that means patients are getting more specialized care and detecting breast cancer in earlier stages. The service was previously offered at PMC on a mobile unit that came to the hospital twice a month. Administration decided to purchase the equipment so that patients did not have to wait on testing for such an important issue. Stereotactic breast biopsy is now offered in a dedicated surgical suite so patients have the comfort and privacy needed for this type of diagnostic procedure. Hologic has trained all surgery techs to use the machine, as well as necessary radiology techs. For more information about the service offered at PMC visit call 606-218-4673.